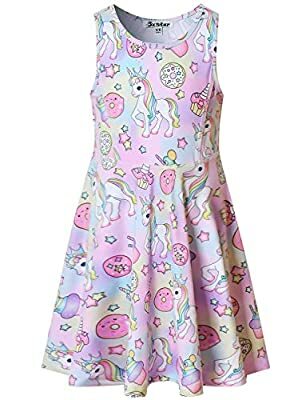 Unicorn fairy collention:Unicorn/Magic/Cat fairy/Bowknot unicorn/Vintage unicorn/ Unicorn fairy/Starry sky unicorn High-resolution print technology and choose very silky elastic and comfortable fabric without pilling .Well made as far as fabric and stitching. Suitable for summer, spring and fall with jacket, coat, shirt, blouse. The best choice for dance,costumes,dress up, party and casual,Beach Available in age:3-13Years . Hand or machine wash, can use dryer.